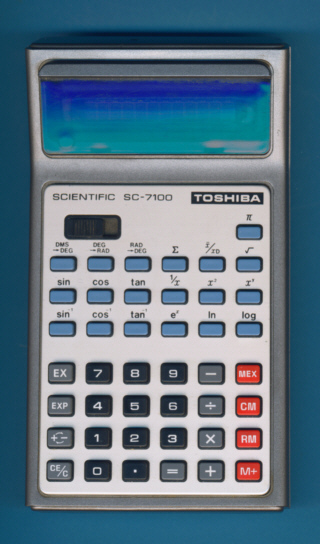 Size: 6.3" x 3.7" x 1.3"
This Toshiba SC-7100 seems to be the first scientific calculator developed by Tokyo Shibaura Electric Co. Ltd., better known as Toshiba. It was delivered in an impressive box, but how does it compare? Do be honest, it compares with the Canon F-6 introduced in 1975, too but using a Hitachi HD3699 single-chip calculator circuit instead the Toshiba T3327. Dismantling the SC-7100 is difficult and we can't show the Toshiba T3327 calculator circuit, but we revealed a single-chip design with a date code of "5K" marked on the chip. We know with the T3329 and T3332 designs from the same era, but they were located in simple 4-function calculators, e.g. the BC-817 and BC-8016. This indicates limited program space for the math algorithm and running Mike Sebastian's "Calculator forensics" gives an unacceptable bad result of 9.148251 instead the expected value close to 9.0000. We assume that the T3327 was Toshiba's first approach for a single-chip scientific calculator circuit, the later T3636 was located in the SLC-8300. Don't miss the SC-7500 based on a Mitsubishi M58628-001 chip. © Joerg Woerner, November 13, 2008. No reprints without written permission.